Zawadi Namagazuzyo was about 12 when she was forced to flee her native Congo. Her mother and many family members were dead. Her father wanted her to live. “There was fighting, a lot of fighting,” she said, recalling how the two of them ended up at a refugee camp in Zambia. She grew up there for 13 years -- getting married, giving birth and always waiting to be resettled somewhere else in the world. Then 10 months ago, Namagazuzyo and her family were resettled in San Diego County, where her father had been living for a few months. 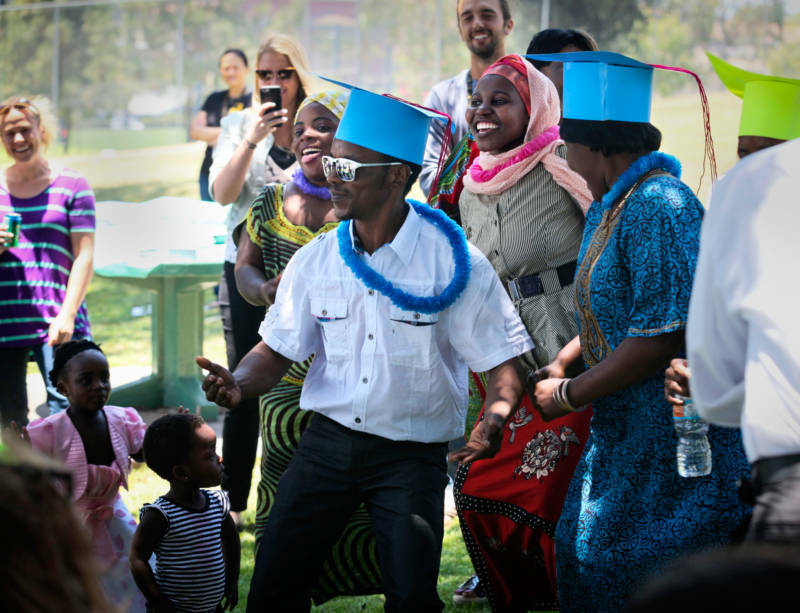 And under a brilliant sun on a recent Friday, she joined other refugees at a picnic to celebrate their graduation from a 12-week English intensive class. 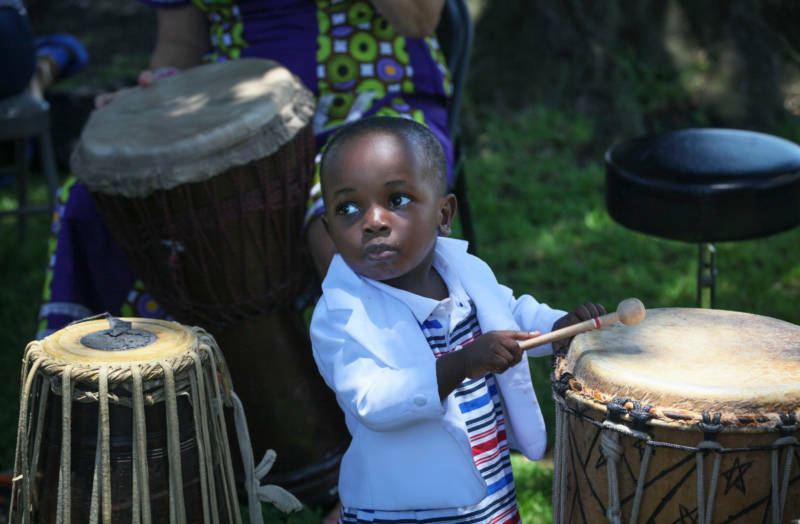 Drumming reverberated through the park, Congolese and Somali dishes were spread out alongside pizza -- and a red, white and blue cake anchored the dessert section. "I ask questions about the life in San Diego, about the rent, bills, electricity,” said Namagazuzyo, who was surprised to find so many fellow African immigrants in her new home. “We speak together the language, we are many in San Diego. I feel good." For nearly a decade, no California county has received more refugees than San Diego County, followed by Los Angeles and Sacramento, according to state and federal data. 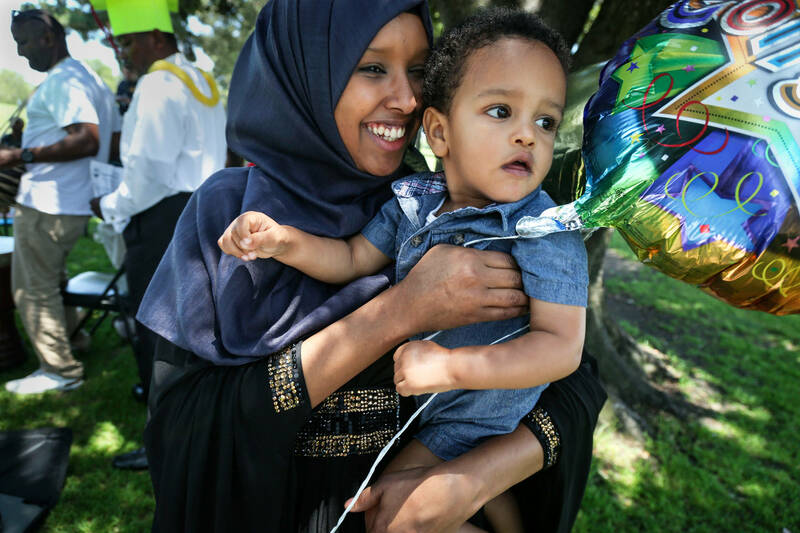 A large number of refugees are assigned to San Diego because of its concentration of four resettlement agencies and the existence of several rooted immigrant communities already in the area. The trend dates back to the Vietnam War, when hundreds of thousands of Southeast Asians landed at Camp Pendleton for U.S. resettlement. Many stayed, helping make the area a beacon for people fleeing from violence, hunger and instability. At a time when President Trump cites terrorism as justification to crack down on immigration -- the U.S. Supreme Court on Wednesday upheld, for now, key provisions of his ban on refugees -- California lawmakers are working to extend the Golden State’s welcome to the world’s displaced people. Democratic legislators from counties with significant refugee populations are pushing bills to help with education and employment, and secured a $10 million budget allocation to help refugee children. Trump’s current executive order states that more than 300 people who entered the United States as refugees are currently under FBI counterterrorism investigation, and cites two examples of convictions -- including a Somali man brought to the U.S. as a child refugee and sentenced to 30 years in prison for his role in the plot to bomb a Christmas tree lighting ceremony in Portland, Oregon. It also would cut the number of refugees admitted this fiscal year from 110,000 to no more than 50,000, saying any more would be “detrimental” to the country. It’s unclear what that means for refugees from countries that the order singled out for a broader ban: Iran, Syria, Libya, Sudan, Yemen and Somalia. The U.S. Supreme Court will hear challenges to the order this fall. “They’ve had to flee some of the most horrific things human beings have to offer, they are escaping war, they are escaping terrorists, they are escaping ISIS, they have been vetted and now we are putting them through another merry-go-round of uncertainty,” Murphy said. Last year the U.S. admitted nearly 85,000 refugees. More than half went to just 10 states, including Texas and New York, but the largest group, 7,908 refugees, settled in California, according to a Pew Research study. And 3,100 of those landed in San Diego County, along with another 520 military interpreters on special immigrant visas, who are also classified as refugees. Since the end of the Vietnam War, California has welcomed 732,000 refugees, according to state data. During that time, San Diego resettled more than 85,000 refugees -- roughly equal to the entire population of cities such as Chico or Newport Beach. You see it, hear it and feel it as you walk the streets of the City Heights neighborhood east of downtown San Diego, where shoppers throng Somali, Ethiopian and assorted Asian restaurants and a cacophony of languages ricochets in the air. In the nearby city of El Cajon, where Arabic speakers do a brisk business in shops along Main Street, Iraqi Christians known as Chaldeans number an estimated 60,000. Many arrived as refugees. “San Diego has the fault of having the best weather in the world,” said Bishop Bawai Soro of St. Peter Chaldean Catholic Church, which is now looking for a third location in which to hold its overflow services. Soro himself arrived in Chicago as a refugee 40 years ago, and today he ministers to the infusion of Iraqi refugees in San Diego. The office of the United Nations High Commissioner for Refugees defines a refugee as someone who has “been forced to flee his or her country because of persecution, war, or violence.” The U.S. government further defines a refugee as someone who may “face persecution based on religion, political opinion, race, nationality or membership in a particular social group.” As a result, waves of refugees tend to reflect global conflict zones. Once refugees have applied for refugee status from the U.N., the agency, the U.S. Embassy or other nongovernmental agencies may refer refugees for resettlement in the U.S. That referral kicks off an application process that can take years. The average wait time in a refugee camp is 17 years. When considering a refugee, the U.S. conducts one of the most rigorous vetting processes of any person allowed into the country, according to the U.S. Department of State. Accepted refugees have little say about to which state or county they will be sent. Two factors play a role: if a refugee has family members in a certain locale, and if a large community of refugees from the same country has already settled in a given area. The idea, Murphy said, is to provide a home where refugees will find support and a network to help them settle in. More than two-thirds of refugees, he said, do have some sort of family connection in the States. Refugees enter the U.S. on refugee status and after a year they must apply to become a legal permanent resident, which grants them a green card. After five years in the U.S. they can apply for citizenship. In San Diego, the majority of recent refugees are from Iraq and Afghanistan, according to the San Diego Refugee Forum, a collaboration between the four resettlement agencies in the county -- IRC, Catholic Charities, Jewish Family Services, and the Alliance for African Assistance. “We want California to put out the welcome mat for refugees, many of whom assisted our military as interpreters overseas, to help them normalize their lives and be more productive members of our communities,” said Assemblywoman Lorena Gonzalez Fletcher, a Democrat from San Diego and co-author of the refugee bills currently being considered in the state Capitol. The legislators have claimed one victory already -- the final state budget approved in June allocates $10 million to be used over three years for high-refugee-population school districts to help support and integrate refugee children. The federal government funds the bulk of refugee costs, funneled through resettlement agencies. This year $37 million of that came to California. The funds pay for initial housing costs and then provide cash aid for the refugees for about 90 days, until refugees must begin paying their own expenses. Refugees are required to pay back the organization that transports them for the travel expenses incurred in getting them to the U.S. In addition, refugees may receive help from programs such as CalWORKs (cash and food assistance) and Medi-Cal (health care) that are funded by both the state and the federal government, according to the state Social Services Department. The agency does not keep data specifically on what those costs are for this group. One of the bills would allow refugees and special immigrant visa holders to pay in-state tuition rates upon arrival at public colleges. No one voted against it in the Assembly, although 15 members skipped the vote, and it’s now before the Senate Appropriations Committee. Another proposal would allow special immigrant visa holders who pass certain tests to move to the top of hiring lists for particular government jobs. It’s on hold until next year, McCarty says, while sponsors work out details. Among opponents: the Service Employees International Union Local 1000, which complained that it went too far by offering refugees special consideration otherwise reserved exclusively for U.S. veterans. Critics, such as the organization Refugee Resettlement Watch, insist the program disregards the impact refugees have on U.S. natural resources. They also contend that it’s wrong for the U.S. to welcome refugees that will provide cheap labor for certain industries and end up receiving welfare and other taxpayer-funded aid. When refugees arrive in the U.S., resettlement agencies work with them for an intense 90 days to help them find jobs, open bank accounts, register their children for school and set up their lives. After that, the agencies offer other services that refugees can apply for, such as auto and business loans. Back in City Heights at IRC’s New Roots Community Garden, where mainly refugees tend some 95 plots, the greenhouses are filled with edibles rustling in the breeze. Idzai Mubaiwa, 51, stretches her arms out over her three lush plots, bursting with kale, collard greens and sugar cane stalks. She arrived in San Diego 15 years ago from Zimbabwe, and remembers being the newbie absorbing the cultural shocks of American life, such as how children don’t have to wear school uniforms. Now her daughters are graduates of or are in college -- one on a scholarship at Vassar. 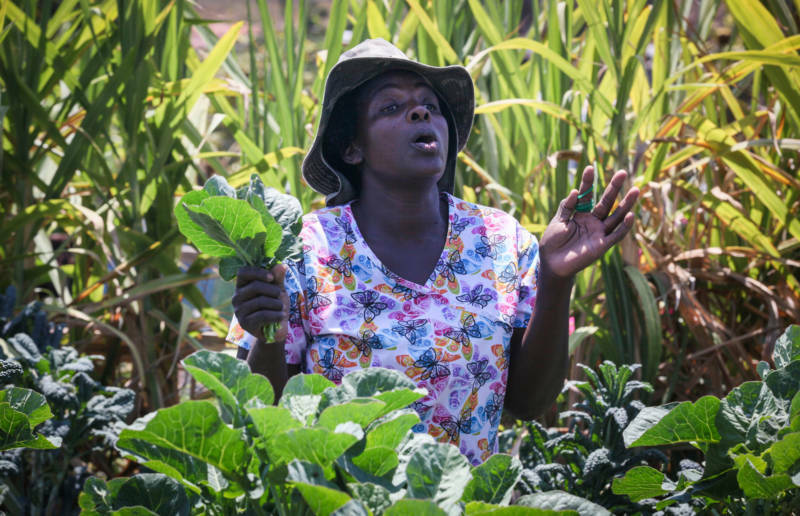 She grows corn as her family’s chief food source, but the rest of the rows she plants to sell at local farmers markets under the name African Sisters Produce. She picked up on what people are looking for. Kale has been hot. And that’s why this year she’s finally trying her green thumb on a California staple: strawberries.